The Institute on Taxation and Economic Policy (ITEP) released a report last month titled Who Pays? A Distributional Analysis of the Tax Systems in All 50 States. The study attempts to examine the overall level of regressivity of the tax systems of the fifty states and Washington, D.C. and presents state and local effective tax rates (total state and local taxes paid as a percentage of income) for each state’s five income quintiles. The report finds that nearly all states have regressive state and local tax systems. The report also surveys the features of each state and local tax system, characterizing each feature as either regressive or progressive. Some of the tax system characteristics that ITEP regards as regressive are narrow income tax brackets, lack of a state income tax, and high reliance on sales and excise taxes. Progressive characteristics include little reliance on consumption taxes and graduated income tax rate structures. Here we present three issues with ITEP’s conclusions and policy recommendations, in addition to their methods of presentation. Issue #1: ITEP advocates tax policies that dampen economic growth in favor of short-term income redistribution. A tax system should choose long-term economic growth over short-term redistribution. Tax Foundation Chief Economist Dr. William McBride recently published a comprehensive review of the literature on the empirical relationship between taxes and economic growth over the last three decades, finding overwhelming evidence of a negative relationship between the two. What’s more interesting is that among the work that examined specific tax types, researchers found that the most harmful to growth were corporate and individual income taxes, followed by taxes on consumption. The least harmful were taxes on property. The more we try to make an income tax progressive, the more we undermine the factors that contribute most to economic growth: investment, risk-taking, entrepreneurship, and productivity. This is because high-income earners tend to do much of the saving, investing, risk-taking, and high-productivity labor. ITEP suggests that states move toward a tax revenue source that would harm future economic growth in favor equalizing incomes in the short term. Issue #2: ITEP recommends that state and local governments rely on unstable sources of revenue. ITEP suggests states move more toward progressive income tax systems. Income tax revenues, however, are much more volatile from year to year than sales taxes or property taxes. Using state and local government finance data from the U.S. Census Bureau, we analyzed the U.S. totals of various combined state and local tax revenue sources to identify the most volatile sources of tax revenue from year to year. Figure 1 shows the annual percentage change in various types of state and local tax revenues. The Census data indicates that the most volatile source of combined state and local government tax revenues in the U.S. is corporate income tax, followed by individual income tax and sales and gross receipts taxes. Property tax revenues are the least volatile from year to year. These findings are confirmed by a 2010 Tax Foundation analysis of state tax revenue volatility by tax type, which found that corporate income and personal income tax revenues were the most volatile. Further, the general shape of annual changes in revenues from taxes on corporate income, individual income, and sales and gross receipts closely follows the shape of the overall economy. Changes in income taxes, however, are much more pronounced as the overall economy changes. In their analysis, ITEP punishes states that depend heavily on consumption taxes as a main source of revenue while advocating moving toward income taxation. Depending largely on a volatile source of revenue can cause budget issues in the event of an economic downturn. This is especially important in light of the inadequacy of state rainy day funds in providing additional funding during the most recent recession. Comparing the 2009 data to the pre-recession data for 2007 shows that not only did the number of millionaires fall by 40 percent, but the overall income of millionaires fell by 50 percent. The result for the U.S. Treasury was that 54 percent of the total drop in tax revenues during this period was due to the falling tax collections from millionaires. Though this example uses federal tax collections, the principle still applies to state and local governments. The more a government relies on volatile sources of revenue, the more unstable overall funding will be when the economy dips. Issue #3: ITEP includes one regressive feature of the federal income tax in its calculations, but excludes the rest of the highly progressive federal income tax. Perhaps the most problematic part of ITEP’s report is its selective inclusion of federal policy. When ITEP presents effective state and local tax rates they also include what is known as the federal offset. The federal income tax code allows taxpayers who itemize their deductions to claim tax payments to state and local governments as a deduction. ITEP argues that since this benefit disproportionately helps high-income taxpayers lower their total tax bill, it should be accounted for in an analysis of regressivity. Including the federal offset in an analysis of state and local tax structures is misleading because it is a feature of the federal tax code, not state and local tax systems. When the federal offset is not included in the calculations of state and local effective rates, ITEP’s regressivity conclusions are much less severe. ITEP also breaks the top quintile into three smaller income groups, making the difference between the richest and the poorest appear much more pronounced. In the following analysis, we present the top quintile as a whole, rather than breaking it up into smaller income groups. Figure 2 shows the U.S. average of state and local effective tax rates, with and without the federal offset. Though ITEP’s reported state and local effective tax rates excluding the offset still appear mildly regressive, the difference is only 3.6 percentage points between the highest 20 percent and the lowest 20 percent, rather than the very misleading 5.5 point difference between the highest 1 percent and the lowest 20 percent originally presented in the report. Including the federal offset makes effective tax rates look much more regressive than they actually are. It is also important to present the amount of taxes paid to the federal government by various income groups because it provides context for ITEP’s results. 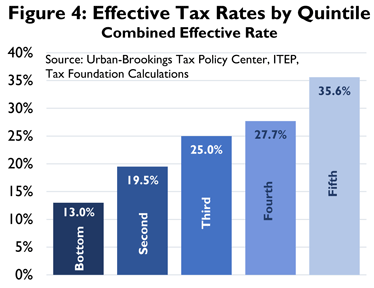 Figure 3 shows federal effective tax rates under the American Taxpayer Relief Act, as reported by the Urban-Brookings Tax Policy Center. These rates are presented alongside ITEP’s national average effective state and local tax rates by income quintile to demonstrate the high degree of progressivity of federal effective rates compared to state and local effective rates. Figure 4 shows the two types of effective rates combined. Federal effective rates are progressive to a much higher degree than the regressivity of state and local effective rates. 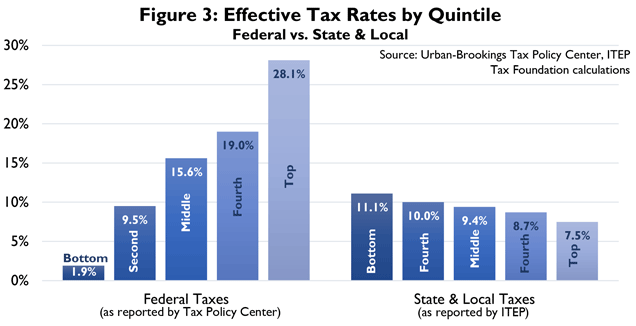 The difference between the top and bottom quintile’s federal effective rate is 26.2 percentage points, while the difference between the top and bottom quintile’s state and local effective rate is only 3.6 percentage points. If the two are combined, the difference between the highest and lowest effective rate is 22.6 percentage points. When the entirety of the tax system is examined, the top 20 percent of individuals pay a much larger percentage of their income in taxes than the other four income groups. ITEP should not pick and choose which federal tax policy information to include in their analysis because doing so skews the results in favor of their desired result. “Fairness” is a subjective concept and by ITEP’s own admission, “in the eye of the beholder.” Ultimately, ITEP’s recommendations are at odds with sound state and local tax policy. Institute on Taxation & Economic Policy, Who Pays? A Distributional Analysis of the Tax Systems in All 50 States? (Jan. 2013), http://www.itep.org/pdf/whopaysreport.pdf [hereinafter ITEP Report]. Jens Arnold, Do tax structures affect aggregate economic growth? Empirical evidence from a panel of OECD countries, OECD Economics Department Working Paper No. 643 (Oct. 14, 2008), http://search.oecd.org/officialdocuments/displaydocumentpdf/?doclanguage=en&cote=eco/wkp(2008)51. U.S. Census Bureau, State and Local Government Finances, fiscal years 1993-2010, http://www.census.gov/govs/local/. Joseph Henchman, Trend #8: Insufficient Rainy Day Funds, Tax Foundation Fiscal Fact No. 306 (June 5, 2012), https://taxfoundation.org/article/trend-8-insufficient-rainy-day-funds. John Hood, Left is Wrong on Tax Fairness, Carolina Journal Online, Nov. 17, 2011, http://www.carolinajournal.com/daily_journal/display.html?id=8492. Tax Policy Center, Distribution Tables by Dollar Income Class: Distribution Tables by Percentile (Jan. 1, 2013), http://www.taxpolicycenter.org/numbers/displayatab.cfm?Docid=3756&DocTypeID=2. See ITEP Report, supra note 1, at 2.